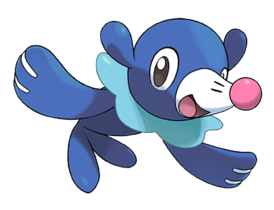 Today’s Pokémon is something of a dark horse contender for most adorable Pokémon of generation VII. Sure, it’s so ugly that it turns the old cliché “if looks could kill” into a grim reality, but it just wants to be loved, and the well-meaning adage “be yourself” has led it to one too many tragedies. Horrifying as it is at first glance, it’s hard not to sympathise with it once you learn the trials and tribulations that plague Mimikyu: the Disguise Pokémon. Today’s Pokémon are… not bees. We think. 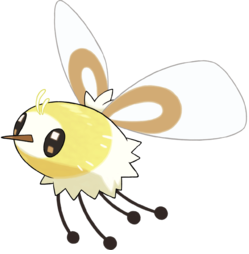 As their species designation – the Bee Fly Pokémon – attests, Cutiefly and Ribombee are based (in Ribombee’s case, somewhat loosely and with the addition of fairy-like traits) on bee flies. Bee flies, as their remarkably inventive name suggests, are a family of insects within the fly order, Diptera, that pollinate flowers and look like bees, though they are usually smaller. They are related to predatory robber flies, and despite their fuzzy appearance, most bee flies are parasites that will lay their eggs on the larvae of other insects, typically beetles or solitary bees, resulting in the slow and gruesome death of the larvae. There are over 5000 species of bee fly around the world (because clearly the world needed that many), but the particular one referenced by Cutiefly is the adorable internet celebrity Anastoechus nitidulus, a rare species that lives only in southwest Japan, in the area around the city of Okayama. As far as I can tell, this species is so rare, and bee flies in general are so poorly studied by entomologists, that it doesn’t even have an English name – I’ve seen them called “tiger bee flies,” which I think is an attempt to translate the Japanese name toratsuri-abu, but in English the name “tiger bee fly” ought to refer to a different species of bee fly, the larger, blacker and more sinister-looking Xenox tigrinus, which can be found throughout North America. Thankfully, Cutiefly already represents a fully adult bee fly, so we don’t have to observe first hand the family’s parasitic tendencies; instead we see only the adults’ more palatable diet of nectar, which they harvest with their mosquito-like proboscises. Cutiefly and Ribombee express this through their flavour text, through the Honey Gather ability they share with Combee, and through their in-game distribution in the areas in and around Alola’s Oricorio meadows.